As you may know, Judge Ronald Whyte is retiring from the Northern District of California. 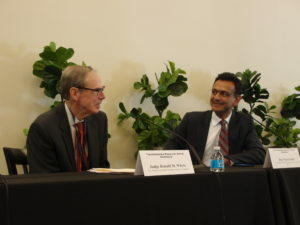 Last week, a symposium at Stanford celebrated his contributions to IP law, especially patent law. The Recorder’s writeup. My photo album. Judge Whyte’s Internet law jurisprudence may be overshadowed by his patent law jurisprudence in this audience, but it has not been overlooked by the Internet law community. At least two cases have made appearances in Internet law casebooks (RTC v. Netcom and eBay v. Bidder’s Edge). 1) He was a federal judge in the Silicon Valley during the 1990s Dot Com Boom. All of the big Silicon Valley brands appeared on his docket. He oversaw some of the highest-profile clashes of titans, such as Cadence v. Avant and Sun v. Microsoft (the original Oracle v. Google over Java variations). This gave Judge Whyte an outsized influence on the development and growth of the Internet. 2) Judge Whyte demonstrated comfort with Internet technologies at their earliest stages. Ex: USENET in 1995, Java in the late 1990s, online robots and proxy servers in 2000, and virtual worlds in 2009. Internet law cases often rival patent cases for technological complexity, and Judge Whyte’s facility with novel technologies seemed to benefit from his patent work. Although I taught the RTC v. Netcom case in the 1990s, it had been many years since I’ve read the opinion again, and it’s quite a revelation. It covers a lot of the key issues about liability for operating the Internet, and I was amazed at how many of the issues are still being debated over 20 years later. * it’s a technologically complicated case. It involved the uploading of a copyrighted Church of Scientology religious text to USENET by a user, who connected to USENET via a bulletin board service (BBS), which got its USENET services from an upstream Internet access provider (Netcom), which in turn distributed the text via USENET to a global audience of readers who each downloaded the text. The Church of Scientology took a broad view of who was liable for the alleged infringement (basically, all of the people mentioned)–an approach that continues today as IP owners continue to focus on everyone other than the actual infringer. It took a lot of technological sophistication to sort through these data flows and grok how USENET and BBSes work. That would be a challenge at any point in the Internet’s history, but a special challenge in 1995 when both USENET and BBSes were obscure. * the opinion is remembered as a defense win because the court denied a preliminary injunction because of low substantive merit. Still, the opinion is nuanced, and both sides won specific issues. * it articulated the “volitional” defense to direct infringement, a requirement that the defendant proximately cause the infringement. The contours of the volitional defense still remain hotly contested. * it required particularized knowledge to hold a defendant liable for contributory copyright infringement. Netcom defeated contributory infringement because of the “copyright holder’s failure to provide the necessary documentation to show that there is a likely infringement.” This morphed into the “notice-and-takedown” rule that became codified in 17 USC 512(c). It’s rare, or even unprecedented, to put the burden on copyright owners to take pre-litigation enforcement steps before liability can be imposed, yet this case contributed mightily to that development. As you can see, several of the rulings from the Netcom case formed the template of the DMCA’s online safe harbors. In turn, the DMCA formed the template for the EU E-Commerce Directive. So this proved to be a relatively rare situation where a district court opinion helped establish global standards. Mark Lemley: Judge Whyte wrote 410 opinions in IP and Internet Law. Mark didn’t see many Westlaw’s “red flags” when reviewing the cases, even though many of Judge Whyte’s patent rulings came during turbulent times in patent doctrine. Judge Whyte has been a driving form in judicial education on patent law and in development the model district court rules and model jury instructions for patent cases. Peter Menell: Judge Whyte has been a litigator’s judge because he thought about each case’s broader implications for society and worked for the efficient administration of patent cases. Judge Whyte has been a judge’s judge because of his mentorship to other judges and because his opinions are written for other judges. Judge Whyte has been an academic’s judge because his opinions made it into casebooks despite not being appellate opinions. Also, he helped with judicial education. Finally, his clerks would say their clerkship was the best year of their lives. Rob Merges: Judge Whyte is an example of why the US judicial system is so respected worldwide. Judge Phyllis Hamilton: Judge Whyte handled 7,000 civil cases and 1,000 criminal cases. He is patient and polite and has a searing intellect. He would ask litigants “why do you care?” to help them focus on and prioritize their key issues. He is a kind and gentle person who is respected by all of his colleagues. Judge Lucy Koh: she’s asked for his mentorship so often that she’s grateful he hasn’t taken out a restraining order against her. Judge Richard Seeborg: Judge Whyte isn’t the one to demonstrate that he’s the smartest guy in the room (even though he is). In addition to his many laudable contributions to the jurisprudence and to judicial administration, Judge Whyte has been a long-time friend of Santa Clara Law and the High Tech Law Institute. Several people noted how Judge Whyte audited a patent course at SCU in 1992 because he wanted to understand patent law better after he joined the federal bench. He has been a long-time member of our advisory boards, such as our High Tech Advisory Board, and he has employed so many students as externs and clerks. We celebrate his many contributions and lament our loss of his services as a judge, and we hope he will remain involved with the school for a long time.